If you’re seeking stats from 2008, I’ve compiled them on this similar post of 2008 social networking stats. Update, now see the 2010 stats. This LA based media company owns Pluck (community platform) and several social media sites, which I’ve dubbed curated social content. Now over 2500 writers contributing pitches, ideas, and feedback in our virtual writers room. 175mm users, with 600k daily growth of users, with the fastest growing segment “45% of Facebook’s US audience is now 26 years old or older.” Inside Facebook, Feb 15th, 2009. “Women over 55 remain the fastest growing group, and growth among the teen and college-age set has been relatively paltry. In absolute numbers there are now even slightly more members between the ages of 45 and 65 than there are 13-to 17-year-olds.” Wired Magazine, March. Facebook hits 300mm users as of Sept 15th, they were 250mm in July, showing significant growth. The challenge? We don’t know how many accounts are active, registered doesn’t mean they are returning. Secondly, there are still large social networks like email to contend with: Yahoo, Gmail, AOL, and MSLive. Sept 15, 2009. Facebook fan page stats based on analysis of over 600,000 pages by Sysmos, Nov 2009. 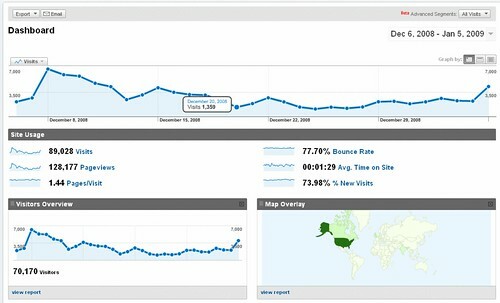 “the site’s traffic is up in the recession. It hit 36 million members last Monday and is adding them at a rate of about one member per second. According to ComScore, it’s gone from about 3.6 million unique monthly visitors a year ago to 7.7 million today, Adage, March 2. Having spent time with Ev and Biz, they don’t provide a lot of data and certainly not a total user count, as a result, we often have to estimate based on the following sources. “-the average user has 126 followers; -only 20% of its traffic comes through the Twitter website; the other 80% (logically) comes from third-party programs on smartphones or computers. So if you’re looking at Twitter stats on your website, you’re probably underestimating that source of traffic by a factor of five; -an early peak test of the service came during President Obama’s inauguration in January, when more than 300 tweets per second were being added to the message queue.”Guardian UK (Quoting Twitter’s Engineer Weaver), June. Xing has 6.5 million users, many of which have paid accounts. Yelp had 25 million daily uniques in August 2009 and have over 7 million reviews on the site to date –told to me by Yelp in October 6, 2009. Need more? I have stats compiled in 2008 for AdultFriendFinder, Bebo, Digg, MySpace, Hi5, and many others. I’m simply collecting them in one spot unless I indicate so, these are not stats from my research. As a result, you’ll often see a discrepancy in numbers depending on source. I need your help, as you find references to usage, visitors, or registered members numbers in articles or reports, please leave a comment with the URL. 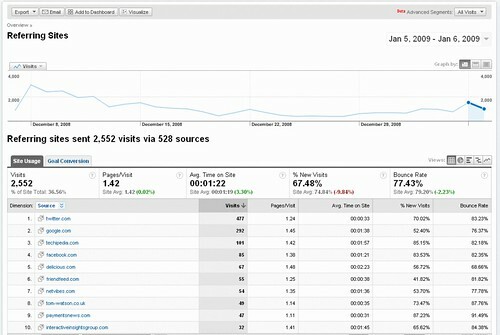 I used to promote my blog posts on Twitter, then when I left Twitter, noticed a significant loss in traffic. Yesterday, I did a blog post encouraging others to tweet then retweet my blog post, as you know, being on a Twitter hiatus gives a unique opportunity to try out some experiments. Here’s the stats from the experiment: In the last 24 hours, 199 folks tweeted these words “How Bloggers Should Inspire Retweets” within 24 hours. Although not all of them used the snipurl I created, there were 2,000 clicks and unique clicks 1,280. This means that the average tweet that linked to the post generated 10 clicks, and about 6.4 unique clicks per person. There were 145 new followers to my twitter account, the daily average is new daily followers 88. This is a lift in follower increase of 60% beyond the daily average. Google Web Analytics showed that to be the top viewed page in last 24 hours, with 954 views, the graph below indicates that traffic returned to patterns before I took my Twitter hiatus. Above Graph: Last 30 days visitors according to Google Analytics to my blog, notice the dip when I started the hiatus on Jan 20th, also coupled by the holidays. 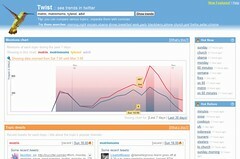 On Dec 5th the twitter experiment started and brought visitors back up to normal levels. Above Graph: Twitter was the top referrer of traffic over the last 24 hours. My experiment on ‘energizing’ (word of mouth) was successful from blog to twitter, learn about my goals. You don’t need to be on Twitter.com as an active user to gain traffic to your site. Since my twitter account wasn’t involved, the number of Twitter followers doesn’t matter as much as we once thought. If you have compelling content, and make it easy for people to share, they will, and then it will rapidly spread through the twitter WOM network. While I do have a good sized blog readership, a marketer with advertising budget could easily generate eyeballs to a blog with less subscribers, and potentially get similar results. If you read the comments, there were several vendors that are going to offer a tweet icon at the bottom of your blog post, or wordpress plugin, so expect to see more of these. This experiment isn’t completely scientifically done, if this were for an official Forrester report, that I’d have several control groups, sample with a variety of different websites, blogs, and twitter accounts to find a pattern. The one conclusion is that I don’t need to tweet to get twitter traffic. Helpful? Copy, Paste, then Tweet it! While in the back of our minds, we all knew this was true. Corporate blogs, like Jonathan Schwartz Blog and Bob Lutz of GM frequently talk about one thing –they’re companies and their products. In fact, some would argue corporate blogs don’t live up to the dream of naked transparency as we saw from Robert Scoble way back in 2006. Instead, many corporate blogs have become a rehash of press releases written in more of a human tone, yet fail to address the real conversation that’s happening in the marketplace. 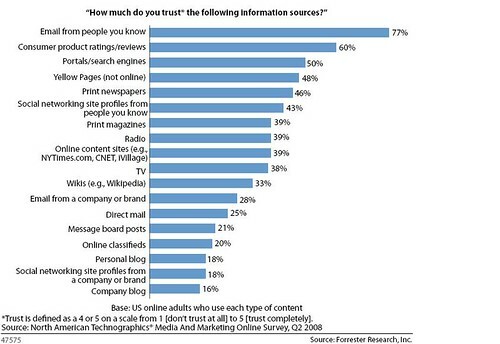 In the above graphic, Josh Bernoff has conducted research and found that consumers said they trusted corporate blogs very little. How little? While I certainly discussed the findings with Josh before the report was published, he has far more details on the report, and answer what you should (and survey methodology) do from his post. For what it’s worth, I spearheaded the corporate blogging program at Hitachi Data Systems, helped my two recent CEOs start blogging, and am an active ‘corporate’ blogger myself. Love to hear your thoughts on this, were you surprised? Update: The Blog Council (a third party organization) has addressed the data, and has listed out many of their trusted blogs, I think most are part of their council. I wonder what the Blog Business Summit, Shel Israel, Dave Taylor will say –did corporations follow their instructions –doesn’t look like it. Update: You can download the report for free, after your register on the Forrester site. 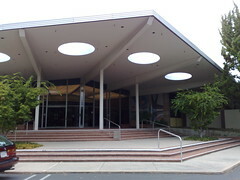 Left: The famed HP Labs think tank in Palo Alto. A few months ago, I spent an entire day with the HP Labs group in Palo Alto, they’re responsible for the R&D and innovation that goes into their thousands of technology products on the market. I was pleased to see this deep dive scientific research on Twitter by Bernardo A. Huberman, Daniel M. Romero and Fang Wu. You can read the free Social networks that matter: Twitter under the microscope (PDF). Written in an academic style, it’s a bit dense for the casual reader. I write for a business audience and I’ll strip out the most important findings, and add my own insight to what I think matters. As always you’re welcome to chime in the comments. If you just need a summary, I wrote this in a way that you can just read the bolded elements to get a sense of the report. I hope this saved you some time. Most users have a smaller inner circle they communicate with: Within a social network, it was found that most only frequently communicate with a small segment of users –even if one has a large community. Makes sense, everyone has an ‘inner circle’. Finding the true network that an individual has (even if they have thousands of “friends”) is what’s really important. Although Scoble solicits imput from thousands of contacts, he leans on a smaller subset of folks to trust above all others. HP Labs Sample Size is @ 6% of the Twittersphere: HP Labs took a random sample set of Twitter users, for a base of number of 309,740 users. According to my social network stats tracking page, Twitter’s total universe is somewhere between 4-5 million (still very small). I’ll value the network on the 5 mil side, so that’s sample size of about 6%, which is pretty healthy. On average, most had 85 followers: They found that the average user has 85 followers in their network, this number seems reasonable when averaged out across the network. On average, most had 80 friends: Most users followed back 80 others, which is close to the actual follower number. Perhaps some weren’t following spam bots, or people that follow everyone. James Governor has been discussing asymmetrical networks, but it appears that on the average, most are symmetrical. Tweet Frequency? About one a day: On average, these users had posted 255 tweets, and since the average users has been around for nearly 7 months, thats about 36 tweets per month, or little bit over one a day. 68%: are active users Social networking stats are almost always flawed, as the vendors don’t disclose how many are truly active. I define active user base as logged in and completed an activity in the last 30 days. Among the 309,740 users only 211,024 posted. It’s unknown if this filtered out spam tweets, although nearly 2/3rds of users have returned (site stickyness. That’s a pretty good return to site rate. The more followers, the more they tweet –up until a point: Figure 1 indicates frequently in posting the more followers they have, right up until about 500 followers where the frequency starts to level out (if the graph were smoothed). The data around number of friends suggests a similar graph, although there’s no saturation point (see figure 2). I’ll suggest the more connections a user has, the more value they have, and therefore are more active. Despite having large networks, a smaller circle is maintained: For users with a high number of followers, they actually only still communicate with a smaller subset of users. This rule remains constant see figure 4. Where’s the value? within the hidden network: To find out the real value of a twitter user and their network, finding out their true network of folks they communicate with on a regular basis will show their trusted network. Finding out who the Scobles’ communicate with the most will determine will help find out how he is influenced. If you’re a social media measurement company, and can find out the true influence model of who people really trust above all other users by looking at actual “@” behavior and follow behavior, be sure to leave a comment below showing how you can do this. Then, conducting this by topic, will find out the true influencers by market segment within the Twitterpshere. As we know, traditional advertising doesn’t work well in social networks, ‘carpet bombing’ isn’t effective. However, conversational marketing is also costly, as you have to spend great resources on labor to communicate with influencers. Therefore brands who want to be effective with their resources should find out who is an influencer in their market and focus their conversational marketing primarily on them. Thanks to the HP labs team who did a great report and really helped to further understanding Twitter better, when you have time, invite me over for lunch, I’m in the area. Seeking stats for 2009? They are being compiled on this updated post. Stats on social networks are important, but I’m going to need your help in creating a community archive, can you submit stats as you find them? To be clear, my employer Forrester doesn’t provide specific numbers about social networks like Compete, Comscore, Nielsen or others, we conduct our own surveys on user/brand behavior, opinions, and technographics, so I’m often asked for these numbers by press. I’ll use this page as a library, and point clients, press, and media to it, so they’re armed. Numbers don’t tell us much without insight and intrepreation, in fact, you’re going to see conflicting numbers of usage from many of the agencies and social networks themselves. The key is to look at trend movements, don’t focus on the specific numbers but the changes to them over time. I put more weight on active unique users in the last 30 days vs overall registered, in fact, the actual active conversion rate will often range from 10-40% of actual users sticking around and using the social network, so don’t be fooled by puffed numbers. No single metric is a good indicator, you have to evaluate the usage from multiple dimensions, so you also have to factor in what are users doing, time on site, interaction, and of course, did they end up buying, recommending products, or improving their lives. Understand how people use different social technologies –the first step before you determine which tools to use. Beth Kanter has an archive of stats she’s taken screenshots of, as well as this handy index list. World’s fastest growing among the top-10 global social networks. Based on the June comScore Media Metrix worldwide figures, hi5 grew 79% in the first half of 2008 – more than twice the growth rate of any of the top 10 social networks. 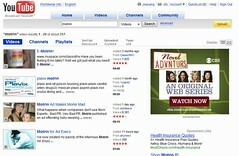 According to comScore, the popular site’s monthly unique visitors increased from 31.4 million in December 2007 to 56.4 million in June 2008 – an increase of 25 million monthly visitors. 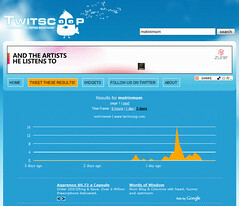 hi5’s October 2008 Worldwide daily average is: 505 million, July 2008 stats, as told to me by Adriana of Corp Comm of Hi5 team. Nearly 60% of LinkedIn users have high personal incomes and hold executive-level or consultant positions, Nov 10th, 2008, LinkedIn, Anderson Analytics. Stats from CEO: 8 million to more than 30 million, while the staff has expanded from 60 to 370 employees, CEO alludes (but doesnt confirm nor deny) that revenues are $75 (million) to $100 million, The average age is 41 years old. The average household income is $109,000; 76 percent of them have a college degree or a graduate degree. It’s pretty evenly split between men and women, slightly more men. Forty-eight percent are outside the United States, from 07 to 2008. Nov, SFGate. Update, Nov 20, 2008: 50 million total registered members, Adding 1.6 million+ members monthly (mostly adults), Nearly 1 million active paying subscribers. Numbers direct from Kate Zentall of Reunion to me. Global visitors to Twitter rose almost fivefold to 5.57 million in September from a year earlier. Nov 12, 2008, Comscore via BBC. HP Labs has conducted research on twitter, I’ve highlighted the average number of followers, friends, tweets, and active user base. Need more stats See this ongoing list of social networking stats for 2009. Caveat: As I mentioned before, do not quote these numbers are from me, I’m simply collecting them in one spot, as you’ll see the accuracy will be debated depending on source to source. I need your help, as you find references to usage, visitors, or registered members numbers in articles or reports, please leave a comment with the URL. 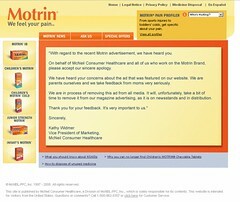 If you weren’t following what was happening online this weekend (yes, yes, ok you’ve got a life) there was a Groundswell against Motrin’s latest viral advertisement that was rejected by mothers in Twitter, spread to blogs, and YouTube. I’m not a mom, so at first glance I didn’t understand the offense, but apparently, it was condescending to moms who perceived wearing babies in a sling as ‘fashionable’ accessory, and who didn’t wanted to be labeled as an ‘official mom’. 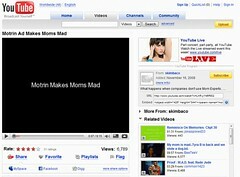 The original video, which was trying to lean on the light side, took to many generalizations with mothers and resulted in a revolt capped by this backlash video. I watch the twitter storm start on Saturday (thanks zsazsa), and watched it carry on through the weekend, I’ve taken snapshots of various analytics and social media tools now on Monday morning. 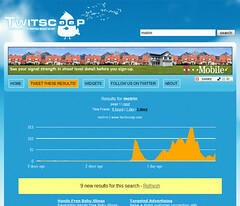 Above Screentshot: Twitscoop’s Twitter Analytics shows peak for “motrin” notice there’s no mention before the ad. Update: Nov 20th, It’s finally hit the search results pages of google for “Motrin”, the 9th link down is to the NYT times blog. 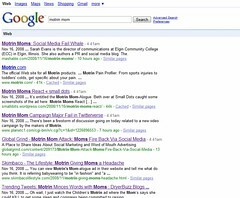 In summary, there were some major blips in social networking tools like Twitter, (it was the top trending topic over the weekend, meaning many saw it that weren’t directly involved) however it’s not likely to cause enough of impact search engine results for “motrin”, be a mainstream press story, or cause damage to stock price. 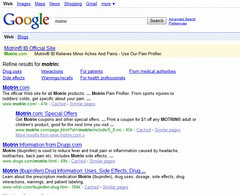 Overtime, these search results may fade away, depending on how Motrin reacts, and how mothers decide to press the situation. Although brand backlash certainly wasn’t intention, I’m sure that some at advertising firm who created the campaign will chalk this up as a success (it got influencers talking about the brand –who previously weren’t), although the PR group certainly has been dealing with this firestorm all weekend.